In 1965, Angus Barbieri, 27, decided he did not want to eat anymore. Weighing 456 pounds, he was sick and tired of being obese and decided to do something drastic about it. He checked himself into the University Department of Medicine at the Royal Infirmary of Dundee and informed his doctors that he planned to lose weight with fasting. He said he wouldn't eat anything until he reached his goal weight of 180 pounds. Doctors agreed with his plan and monitored his progress, though none of them really expected that his fast would last long. To their surprise, days turned to weeks and weeks to months! Doctors prescribed him multivitamins to compensate for his lack of nutrients and conducted regular check-ups and blood work. Angus ended his fast after 382 days upon reaching his weight goal. During his more than a year fast, Angus only drank coffee, tea, and sparkling water. Angus's extreme fasting journey is the longest fast ever recorded. But his is an extreme case. He was morbidly obese and had a lot of stored fat that needed to be burned. But it is this kind of sensational story that made fasting, particularly intermittent fasting, to become popular in recent years. Intermittent fasting gained notoriety in 2012 through BBC broadcast journalist Dr. Michael Mosley's TV documentary Eat Fast, Live Longer and book The Fast Diet, followed by popular books like Dr. Jason Fung's 2016 bestseller The Obesity Code. Celebrities like Terry Crews, Hugh Jackman, Miranda Kerr, Jennifer Lopez, and Beyoncèswear by it, which only adds to its popularity. Intermittent Fasting (IF) is a diet that relies on cycles of fasts and feasts. When in the "fasted"' state, an individual is not allowed to eat or drink for at least 12 hours. It can be complete abstinence of food and beverage or a reduced amount. The "feasting" state is the eating window where unrestricted eating is allowed. 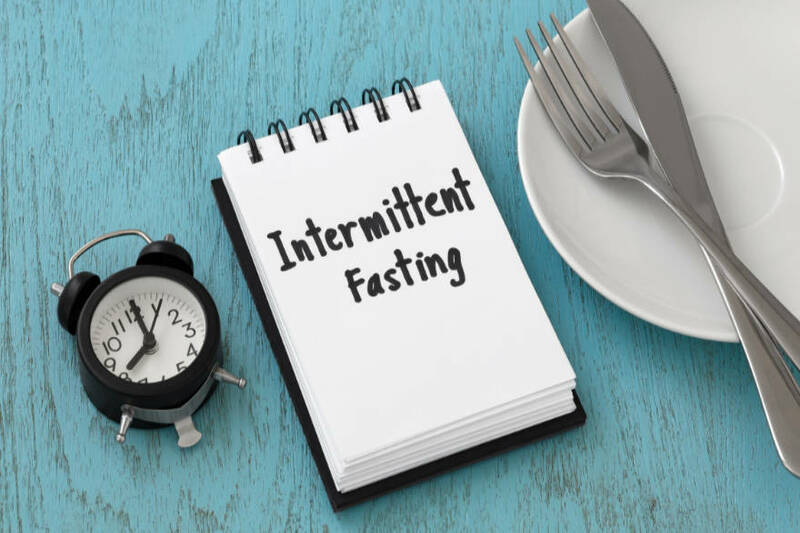 Though fasting has been practiced throughout history, usually for spiritual and religious purposes, the benefits and risks of fasting for weight loss are still being studied. If done right, fasting will not only aid in weight loss but can also increase energy, reverse type 2 diabetes, improve blood pressure and cholesterol levels, and potentially a cancer cure. According to Dr. Fung, "the body only really exists in two states — the fed (insulin high) state and the fasted (insulin low) state. Either we are storing food energy, or we are burning it. It's one or the other. If eating and fasting are balanced, then there is no net weight gain." Store the glycogen (sugar) in the liver. But the liver has limited storage space. When there is enough fat in the liver, the excess must go elsewhere. Body fat deposited around the body. Fat deposits are more difficult to get used up by the body and have unlimited storage space. The process is reversed during intermittent fasting. When we do not eat, insulin level falls signaling the body to start using the stored energy. The sugar level in the blood falls so the body pulls glucose out from storage to burn for energy. It first pulls the glycogen in the liver, which can power the body for 24-36 hours. After that, the body starts tapping the fat deposits for energy. One attractive point of IF that draws people is that it's highly customizable to fit any lifestyle. There are several popular methods to do intermittent fasting. Popularized by fitness expert Martin Berkhan, the 16/8 method involves fasting for 14-16 hours a day and having an "eating window" of 8-10 hours. This time-restricted feeding is simple and easiest to do and is recommended for individuals who want to try IF for the first time since it only involves skipping one meal. For example, if dinner is done by 8pm a lunch at noon will break the fast. Water, black coffee, tea, and other non-caloric drinks are allowed during fast to help reduce hunger pangs. Eating a low-carb diet will make this method effective as junk food or excessive amounts of calories may negate its benefit. The 5:2 or Fast diet was popularized by British journalist and doctor Michael Mosley. It involves eating normally for 5 days and restricting caloric intake to 500-600 on the other 2 days. For instance, eating normally during weekdays and fasting during the weekends. "Normally" in this sense means still sticking to the recommended 2,000-2,500 daily calorie intake. Alternate-day fasting involves alternating between days with food and days with no food. For example, fasting during Mondays-Wednesdays-Fridays and eating normally on the other days of the week. Fasting every other day can mean not eating anything at all or restricting your calorie intake to about 25% of the daily calorie needs. Also known as Eat-Stop-Eat protocol made popular by fitness expert Brad Pilon, whole-day fasting involves one to two days of complete fasting per week. It is almost the same as 5:2 where individuals can fast from breakfast one day to breakfast the next, but the fasting period does not need to be on consecutive dates. For example, fasting every Monday and Friday or just fast every Wednesday. Though non-caloric beverages are allowed, solid food is not. The warrior diet is credited to Ori Hofmekler, a former member of the Israeli Special Forces turned fitness expert. It involves fasting for 20 hours during the day and having a feasting window of 4 hours at night. During the fasting window, individuals are allowed to eat a small amount of fruits and vegetables. This diet was patterned after ancient warriors that consumed little to nothing during the day because they would spend their days fighting, hunting, gathering, etc. and then enjoying a heavy feast at night. This variation of intermittent fasting is paired with exercise and a plant-based diet similar to paleo during the feasting window. OMAD or one meal a day diet is fasting for 23 hours and only eating for 1 hour. Also known as 23:1, the main difference of OMAD to the Warrior diet is that it does not allow the person to consume anything with calories during the fasting window. Breaking fast is usually done during dinner and may or may not involve healthy eating. There is no 'cheat days' because there are no food restrictions in this diet and no counting of calories. Spontaneous meal skipping is a 'natural' way of doing intermittent fasting. It's simply not eating when not feeling hungry, when eating is inconvenient, or when there simply isn't time to eat. As mentioned, one of the most attractive benefits of IF is that it can be adapted to fit any lifestyle. It is simple to follow, practical in application, convenient and cheap as it does not require any specific diet plan, and can be combined with other diet programs to make it more effective. Another strong point for IF is its health benefits. There have been studies that show people who did IF not only had weight loss but also experienced decreased inflammation and lower blood sugar levels. Scientists believe that putting cells in mild stress—which happens during fasting-- strengthens the cells' ability to deal with stress and allows the body to fight off some diseases like type 2 diabetes, Alzheimer's disease, and cardiovascular diseases. Intermittent fasting would be very difficult for someone who likes snacking or grazing throughout the day. However, baby steps can be taken like starting with the 16:8 then shifting to other variations of IF as the body adapts. IF is also not advisable for people who are prone to have eating disorders ( as it may trigger an unhealthy view of food and eating), people on prescription drugs that require food intake, pregnant and lactating women, and adolescents who are in the active growth state. According to metabolic expert Dr. Deborah Wexler, director of the Massachusetts General Hospital Diabetes Center and associate professor at Harvard Medical School, "There is evidence to suggest that the circadian rhythm fasting approach, where meals are restricted to an eight to 10-hour period of the daytime, is effective." Coupled with a healthy diet and lifestyle, losing weight with intermittent fasting can be an effective approach, particularly for people at risk for diabetes. Despite the current scientific studies and anecdotal accounts pointing at intermittent fasting as an effective weight loss program, it is still scientifically unclear if it is superior to other weight loss methods in terms of the amount of weight loss, compliance rate, decreased appetite, and positive biological changes. The best choice for losing weight is to use an eating approach that works and is sustainable for the individual. It would also not hurt to consult a doctor before trying any diet plans. For more information, see this article for answers to some common questions about intermittent fasting.